University of Sydney astronomers joined a historic Australia-China Commonwealth Roundtable on Astronomy at the Shanghai Expo on Monday 2 August 2010. Professor Penny Sackett, Chief Scientist of Australia, chaired the historic Australia-China Commonwealth Roundtable on Astronomy at the Shanghai Expo. Leading Sydney scientists, Professor Bryan Gaensler and Professor Elaine Sadler, formed part of the Australian delegation of astronomers who met with Chinese colleagues to cultivate productive, long-term relationships between Australian and Chinese astronomers, institutions and academies, across all areas of astronomy. 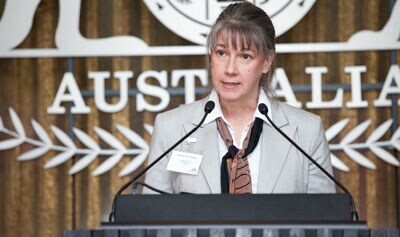 The meeting, chaired by Chief Scientist of Australia, Professor Penny Sackett was hosted at the Australian Pavilion and attended by Deputy Secretary for the Department of Innovation, Industry Science and Research, Patricia Kelly. The themes discussed at the meeting included the Square Kilometre Array (SKA) and SKA Pathfinders, current and future collaborations in Very Long Baseline Interferometry (VLBI), Antarctic astronomy and large optical spectroscopic surveys. An overarching discussion included developments in technologies that support astronomy, and a call for policy discussion on information sharing regarding infrastructure and data collection and archiving. 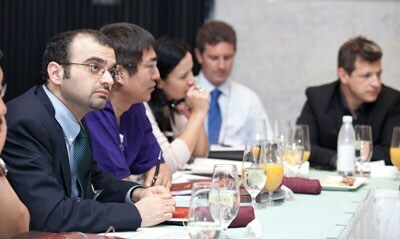 Professor Bryan Gaensler (left), from the University of Sydney, discusses astronomy with Australian and Chinese colleagues at the Australia-China Commonwealth Roundtable on Astronomy at the Shanghai Expo. Professor Madam Ye - former Director of the Shanghai Observatory - called for greater cooperation and for the Australian astronomers to continue to 'come back' to China to strengthen the good will and collaboration established yesterday but to also build on current partnerships. The Commonwealth Roundtable on Astronomy is the first of seven such meetings to be organised by the University of Sydney - a Gold Sponsor of the Australian Pavilion at Shanghai Expo.